José Saramago was a Nobel Prize winning author from Portugal, who passed away at the age of 87 on June 18, 2010. Although Saramago did not receive widespread recognition until he was 60 years old, he has been highly prolific in the years since. Blindness, one of Saramago’s most highly regarded books was made into a major motion picture in 2008. He is survived by his wife Pilar Del Rio and a daughter from a previous marriage. Margaret Jull Costa translates Portuguese and Spanish fiction and poetry. For her work she has won the Portuguese Translation Prize, the International IMPAC Dublin Literary Award, the Oxford Weidenfeld Translation Prize, and the Times Literary Supplement Translation Prize. 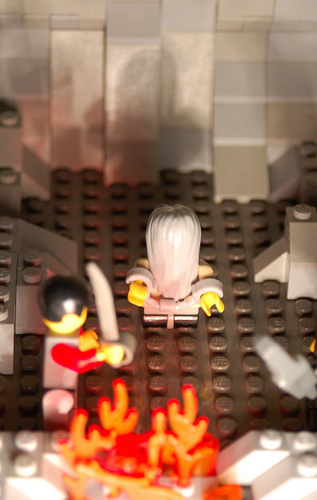 In Plato’s Republic, Socrates expands his theory of forms through the famous allegory of the cave. For Plato and by extension, Socrates, objects existed in two realms: the spiritual and the physical. By definition, the physical realm comprised of imperfect objects; the spiritual realm, on the other hand, contained perfect representations of objects. As an example, consider a drawn circle. No matter how hard one tries to compose this circle, it will never be perfect. Our hands refuse to remain steady; our pencils or pens meet the paper poorly. Nevertheless, we, by definition, know what a circle is. Each point in the circle is precisely the same distance away from the middle point even if we could never compose such an image in real life. Plato, however, penned the allegory of the cave in order to share the same principles. In this cave, shackled people stare at fire-lit images of real-life objects dancing on the cave wall while the real objects exist outside the cave. Put simply, Plato argues that our world is like this cave and our actions are no different than staring at an ancient moving picture. Leaning heavily on this metaphor, José Saramago wrote The Cave with an attention to translating the theory of forms to modern life through the lens of work. Set in an unnamed city, Cipriano Algor is a potter who lives with his daughter, Marta, and his son-in-law, Marçal Gacho in the city’s surrounding countryside. Cipriano molds earthenware in his rustic pottery and exclusively delivers his goods to the Center, a gigantic commercial/residential complex for which Marçal works as a security guard. One day, upon delivering his goods, Cipriano learns that the Center no longer desires his products. Faced with unemployment, Cipriano and Marta devise a new product for the Center to buy: clay figurines. Having received a preliminary order, Cipriano encounters numerous difficulties with his work and his family as they cautiously consider a move to the Center apartments. With Saramago’s typical meta-narrative style and dense sentence structures comprising multiple-page-long paragraphs, the author ponders the superficiality of overtly consumerist capitalism. With the Center functioning as the typical transnational corporation, and Cipriano as the mom-and-pop shop, The Cave acts as an exploration in the value of work and the dehumanizing elements of major corporations substituting human relationship with bottom-line metrics. “The head of the buying department did not respond immediately, he must have been considering whether it was worth amusing himself further with this kind of cat-and-mouse game, but his position on the Center’s organization chart reminded him that the whole definition and maintenance of hierarchical configurations is based on their being scrupulously respected and never contravened or transgressed, and, of course, the inevitable result of being too free and easy with one’s inferiors or subalterns is to undermine respect and to encourage license, or, to put it more explicitly and unambiguously, it all ends in insubordination, indiscipline and anarchy” (111). In contrast to this structured hierarchy exhibited by the head of the buying department at the Center lies Cipriano’s pottery. 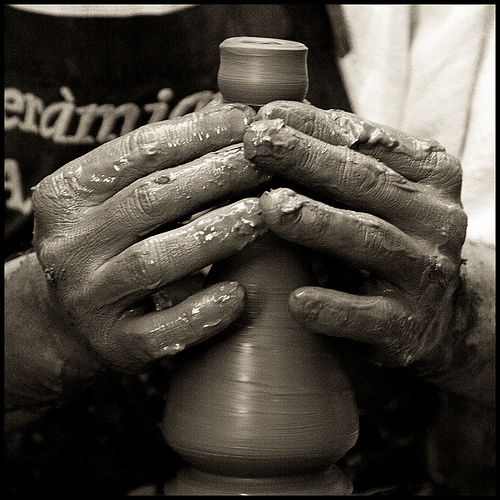 A two person operation at most, the potter labors directly with materials, creating something out of nothing. Despite the beauty in manual labor and the creation of artisan consumer goods, the world is passing Cipriano by. “Cipriano Algor complains and complains, but he does not seem to understand that kneaded clay is no longer stored like this, that it will not be long before the basic ceramics industries of today turn into laboratories with employees in white coats taking notes and with immaculate robots doing all the work” (124). Rightly, Saramago observes the death of manual labor in the developed world. No matter the care one takes in hand making a product, the modern world dictates that the same product can be made cheaper somewhere else. While some people possess gifts of the mind, others, sadly, carry gifts of the hand. Given contemporary culture, this second set of people is finding their work slowly drying up. For Cipriano, his only choice is to become dependent upon the salary of his son-in-law or to move in with Isaura Madruga, a widow Cipriano fancies. As with every Saramago novel I have read, I am floored by the author’s mastery of language and the use of meta-narrative within the storyline. For example, Saramago loves pausing to discuss strange occurrences in language. “Authoritarian, paralyzing, circular, occasionally elliptical stock phrases, also jocularly referred to as nuggets of wisdom, are a malignant plague, one of the very worst ever to ravage the earth. We say to the confused, Know thyself, as if knowing yourself was not the fifth and most difficult of human arithmetical operations, we say to the apathetic, Where there’s a will, there’s a way, as if the brute realities of the world did not amuse themselves each day by turning that phrase on its head, we say to the indecisive, Begin at the beginning, as if beginning were the clearly visible point of a loosely wound thread and all we had to do was keep pulling until we reached the other end, and as if, between the former and latter, we had held in our hands a smooth, continuous thread with no knots to untie, no snarls to untangle, a complete impossibility in the life of a skein, or indeed, if we may be permitted one more stock phrase, in the skein of life” (56). With a sense of poetry and impeccable descriptive language, Saramago ponders the absurdity of clichés. In the span of a sentence – yes, a very long sentence – Saramago formulates the absurdity of a stock phrase before he uses it in his narrative. While only one example, The Cave is littered with these meta-narrative illustrations. Aesthetic comments aside, The Cave ponders work and what it means to be alive in the modern world. What is work? Is it sculpting with your hands or is it sitting at a desk? Saramago likens this comparison to Plato’s allegory of the cave. Without the capability of truly forming an object with the opportunity to sell it in the open market, are we really any different than the shackled prisoners whose only reality dances in shadows upon the cave walls? If this question interests you, if you find the idea about a literary novel waxing philosophically on work, or if you like Saramago’s particular aesthetic prose, I recommend that you read The Cave. I've wanted to read this book for a long time. Now I want to even more. Gonna be added to my christmas wish-list. Thanks for the review and the reminder! Thanks for the comment Sarah! I always recommend any Saramago book so I am glad that the review encouraged you to add the book to the Christmas wish-list. Have you read anything else by Saramago? Although disturbing, my favorite Saramago book, by far, is Blindness. I would consider The Cave to be of similar quality to Death with Interruptions. I *loved* Blindness, and thought the page-long paragraph thing without quotation marks and such was a device to get the reader into the experience of blindness somehow, but it looks like it's just Saramago's thing. I've been reluctant to pick up another Saramago title just because I hold Blindness in such high regard. I'm not sure how he could top it. Thanks for the comment Seth. I, too, hold Blindness in the highest regard. However, I truly appreciate the rest of his work. His magical realism is creative, philosophical, and aesthetically pleasing. To a certain extent, I believe Saramago's modus operandi clarifies the ways in which society works by placing it in absurd and unique scenarios (The Stone Raft is a good example). I highly recommend that you read more Saramago.